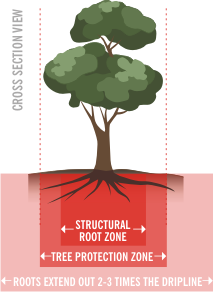 The Structural Root Zone (SRZ) is an area considered essential for tree stability: loss of roots in this area are likely to cause the tree to become unstable in the ground. The SRZ should only be calculated if major disturbance of the TPZ is being considered. The dimensions of the SRZ are determined from the Diameter of the Tree taken above the root flare.